Well, to start, let’s look at how “Ice Mountain” ended. If you remember the last entry, it was pretty complete, but not quite. The shoreline has now been pretty satisfactorily joined to the water. 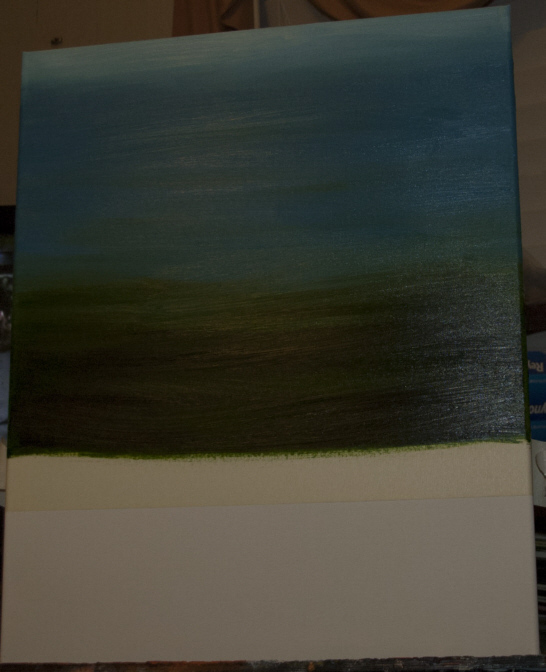 A bit of subtle blending and the job (seems to me) to be done. So what now? 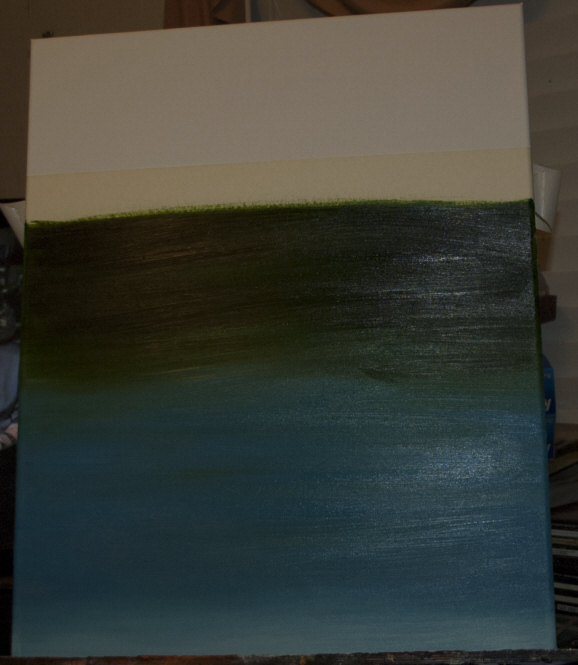 Well, there’s a bit of canvas, and some leftover turquoise and sap green. Let’s make a body of water! 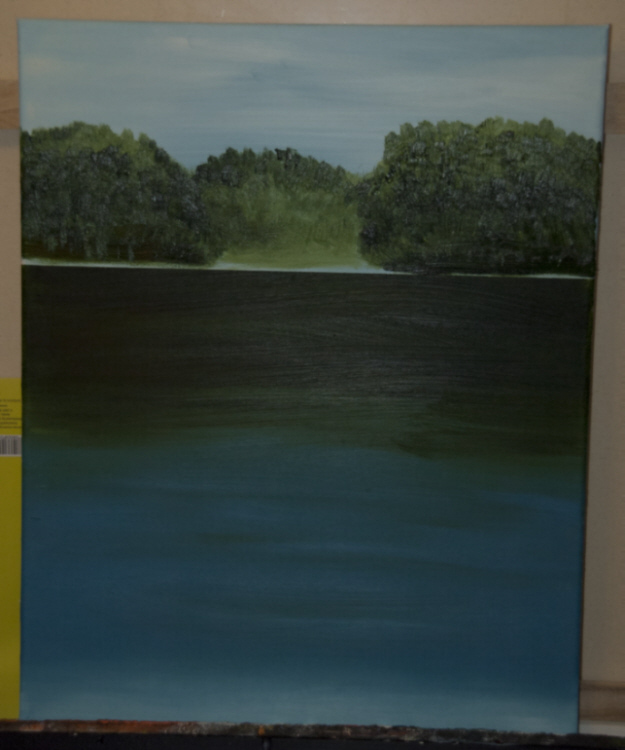 Painted upside down so as to cover the relevant bits of the canvas without worry about having to move things out of the way of the canvas bottom, Hey, easier is cool. It is. 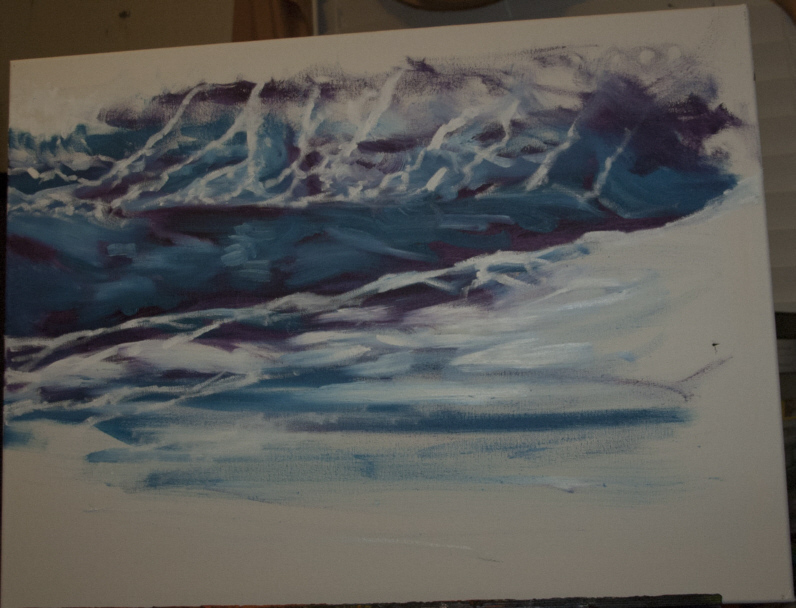 A bit of white used to highlight the “near shore” of course…the water getting shallower as it neared the viewer. 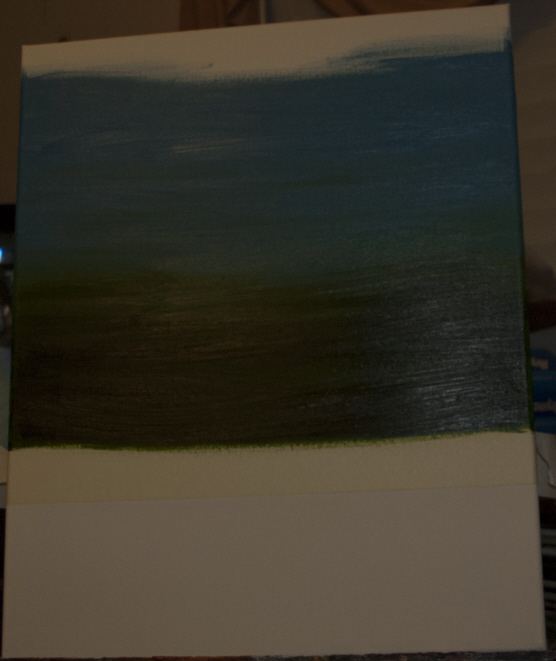 I then added sky and clouds using more turquoise and titanium white to cover the canvas. And, I’m sure you’ll be shocked to learn this, but I forgot to take a picture of that sky. 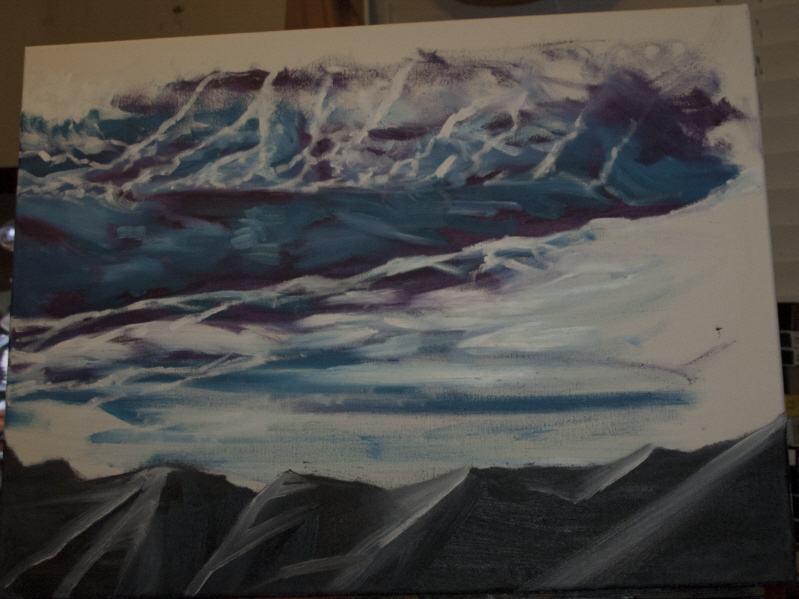 I mean, you’re not missing anything, it’s the same lame clouds I’ve painted before…just on a different canvas. Don’t worry–you’ve missed nothing other than more sap green being plowed into still-wet areas of turquoise and titanium white. What you see here is the product of perhaps five minutes of work. Is it done? Of course not. It’s simply coming to life. Which is always what a painter wants. Well, okay, probably just me, but believe you me, when the image starts working, it means I can let it drive for a while. Who doesn’t want to sit in the passenger seat and let someone else drive, when you know the destination will be worth it? Or at least “worth it” to the two of you–you and the driver. See you next time, and as always, thank you very much for stopping by. Thank you! This one started out as another “let’s get rid of this paint” work. 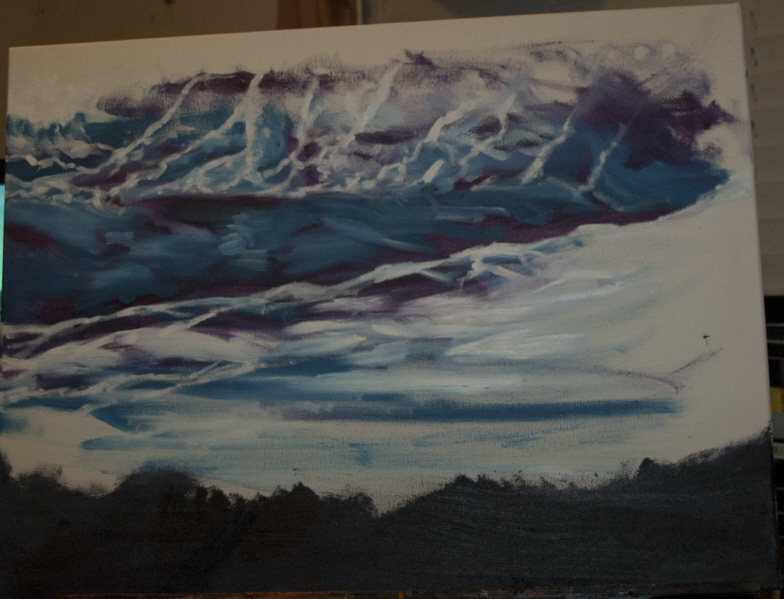 For some reason I had some turquoise, purple and white that I wasn’t going to use, so I did…this. That didn’t really suggest anything, so I let it sit for a while while I worked on other stuff. 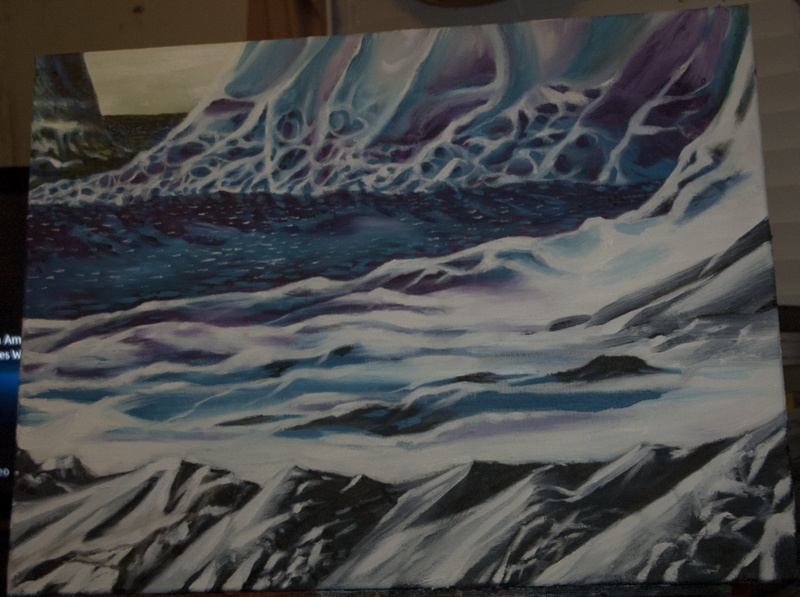 And when I looked at it again, it kind of suggested a landscape, so I used a bit more white and started pushing it that way. I wasn’t sure that this was what I wanted. So I let it sit a bit longer, and then when I looked at it again, I decided I wanted dark rock in the foreground, so out came the Paynes Gray. Snowcapping via more white highlighting. And I kept adding details. Rather than show the other fifty-odd pictures I took, you can see a short video here. This shows the painting at most stages of its evolution. It’s slightly less than ninety seconds. Contains another creepy soundtrack. 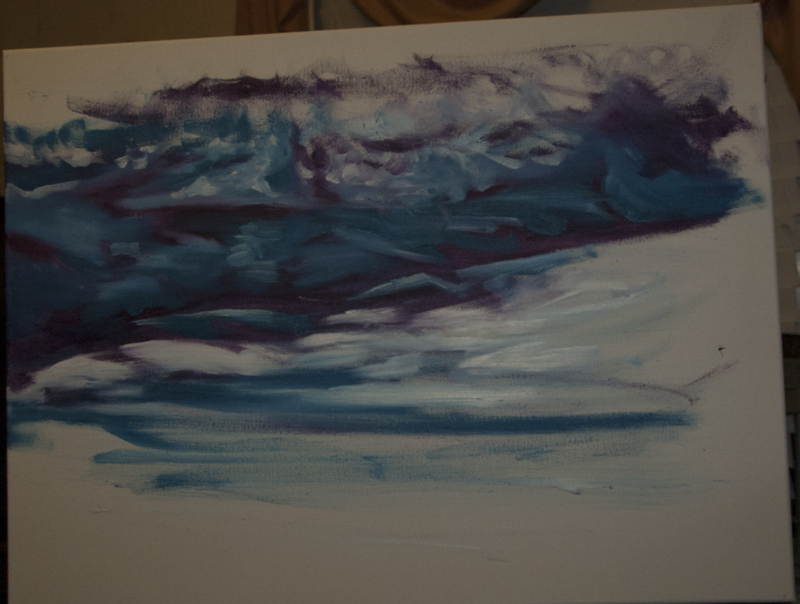 And what we ended up with–so far, at least–is this. Looks pretty different from that thing at the top, doesn’t it? I suppose I should’ve put more stage pictures in this entry–but then, if I decide to do that, this entry will get more and more delayed. So I think the video shows the detail that isn’t represented here. Will there be more work on this? I dunno. We’ll just have to see what 2014 has to offer. In the meantime, thanks for stopping by.